From Album : Just a couple by an irresistable artist. More later if we get texts. These pieces are just a tiny beginning of what we hope might end up becoming an extensive Album of Operetta. 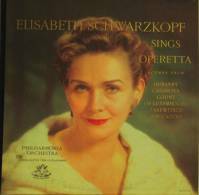 Also we will be favoring recordings of the very great Elizabeth Schwartzopf under Opera and Lieder headings. She not only sang with the greatest elegance and taste but she was comparably so in visual appearance.